2017 was another good year for the industry. Economic conditions improved throughout the year, and with them came higher used car sales and new-car sales only slightly below recent record levels. Used-car sales are expected to climb even higher in 2018 and new-car sales to experience another minor dip from their soaring heights. It should be another good period for this fast-growing and fast-changing industry. However, headwinds are strengthening. Market conditions are becoming more challenging, and technological advancements and consumer expectations are evolving rapidly. Staying ahead of a change curve is getting steeper every year — in the automotive industry and well beyond. 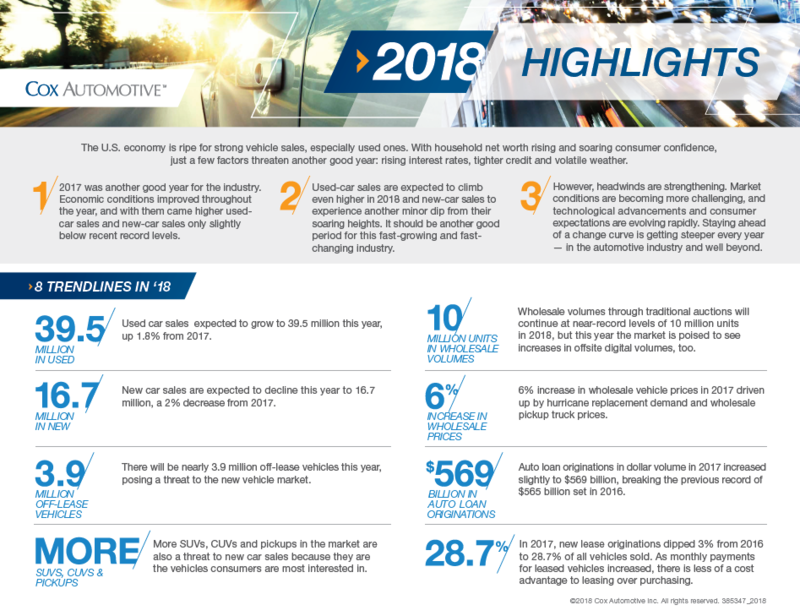 The 2018 Cox Automotive Used Car Market Report & Outlook is packed with salient data, smart insights and keen observations about the used car industry with an eye toward 2018 and beyond. Here are 8 trendlines from the report that we are seeing in 2018. See the highlights from the report.